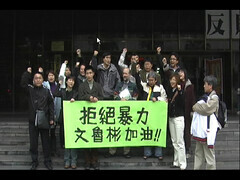 At 4 p.m. on 9 October 2008, the Taipei District Court announced its decision in the case of Robin Winkler (文魯彬, Wun Lu-bin) vs Su Chin-huang (蘇金煌). This arose from Su's battery of Winkler in the kitchen of the Environmental Protection Administration (EPA) of Taiwan's Executive Yuan (Cabinet) on 7 November 2007. Su was found guilty of battery and was sentenced to six months imprisonment, which can be converted to a fine at NT$1000 per day. "There are no dolphins there [at Mailiao]"
Su, head of the Yunlin County Assembly, and Winkler, former commissioner on the EPA's Environmental Impact Assessment Commission (August 2005-July 2007) and a naturalized Taiwan citizen, were attending a screening committee meeting on the proposed NT$137 billion (approximately US$4 billion) investment by Formosa Plastics Group (台塑集團) in a steel plant to be located near Su's hometown. Formosa Plastics Group already has major investments in Yunlin County (雲林縣) and is well known for its infiltration of most of the county's public agencies. Yunlin, also known as one of Taiwan's economically poorest counties, was, until quite recently, one of the most pristine areas on the island with a very rich cultural, fishing and agricultural heritage. 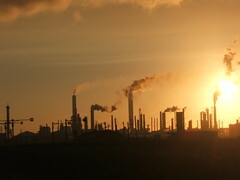 The massive influx of petrochemical plants and related industries that began in the late 80s and continued with a fury throughout the following decades has left the county rife with cancer and other illnesses, acute problems with air, water and soil pollution, and a severely stressed social structure, with one of the highest crime rates in the country. 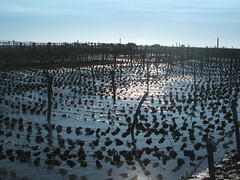 Industrialization of Yunlin, in particularly the Mailiao offshore industrial zone where one of Formosa Plastics' largest facilities is located (including a power plant that was recently named as the world's fifth-largest and dirtiest, up from sixth the previous year), has taken a severe toll on fisheries in the area, particularly aquaculture, due to water pollution and the enormous amounts of river and groundwater needed by the petrochemical plants. Some two thirds of the nation's larval oysters are also farmed in waters in this area. With its industrialization and decline of agriculture, and clearly not coincidentally, Yunlin has grown to be Taiwan's center for so-called gangrelated activities, including having the worst record on vote buying. The relationship between the investors in Yunlin and the gang related activity was underscored in off the record comments of one of the local high level government officials, "the gangsters of Yunlin are all reared and fed by Formosa Plastics". The investment which was the subject of the EPA meeting on 7 November 2007 has attracted a great deal of attention from all sides since the project was first submitted for review in the fall of 2005, while Winkler was a member of the commission. 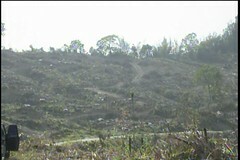 Central government agencies have staunchly backed the project while the local Yunlin government, including the assembly, have been more circumspect, saying they conditionally support the project as long as the promised jobs materialize, local "taxes" and "give backs" to the county are adequate, and there are assurances that damage to social communities and the natural environment will be minimal. Those favoring a longer term approach to economic development, including for the most part those actually engaged in the fishing and aquaculture industries, point to the lack of adequate assessment of all economic, social and natural environmental aspects, the heretofore lack of transparency in the proceedings - including the fact that the commissioners at that time could not obtain full disclosure from the developer and its supervising agency, the Industrial Development Bureau of the Ministry of Economic Affairs (IDB), the unfair allocation of water and other resources, and perhaps most importantly the failure of the government to insist on full and transparent accounting of the costs and benefits of both the promised and actual situation in terms of the development of the Mailiao offshore industrial park (麥寮離島工業區) in general and the more than one dozen Formosa Plastics Group operations. The steel plant project was fully reviewed by the 2005-2007 term of the EPA's screening committee, and a decision was made in March 2007 that the project should go into a second phase assessment. However, a number of procedural irregularities kept the committee's decision from a full review by the commission until new commissioners took office in August 2007. The day of the battery was the day of the fifth screening meeting. Following the presentation by the developer and expressions of support by a number of legislators and local politicians, the chair of the meeting, Cheng Fu-tian, invited representatives from civic groups to comment on the project. As Winkler was testifying on the issue of domestic steel supplies and ongoing investigations in the U.S. and Europe against Taiwan for dumping steel, Su interrupted by shouting out "there are no dolphins there". It was during the testimony by Green Party Secretary General Pan Han-sheng (潘翰聲) – this time about dolphins – that Mr Lee, the head of the local fishers association, interrupted to say he had been going out to sea all his life and knew there were no dolphins in the area. Pan continued to talk while the disruptions grew more hostile until Chen Bing-heng (陳秉亨) of the Taiwan Academy of Ecology (台灣生態學會) said "Here is a video of the dolphins". Lee, with Su right behind him, approached Chen shouting all the way and at that point Su's younger brother, Su Chin-jhen who is the chief secretary of Sihhu township (四湖鄉) in Yunlin County, jumped over two rows of tables landing close to Chen and shouting out, "don't interrupt others while they are talking." Winkler at this time also jumped over two rows of tables and landed just behind Su Chin-jhen shouting, "Yeah right, who is interrupting who?" The situation threatened to turn into a free for all when the EPA officials final stepped in and separated the two parties but not before the Su brothers had said "who let this f*cking foreigner in? What's he doing here?" and then Su Chin-jhen started screaming, "the foreigner hit me, he jumped on my foot". The elder Su (the defendant in the Wun Lu-bin v Su Chin-huang case) tried to get at Winkler saying, "shut up you foreigner" and then indicated that he would "handle this". As he was gently escorted to the hall Su waved to Winkler threateningly saying, "Come on out and let this old man deal with you". The meeting resumed, but at about 4:15 p.m. Winkler went out to the tearoom to fill his water bottle. On his way he noticed the defendant sitting in the hall across from the meeting room, the door wide open, but didn't think much about it. Su and another person followed Winkler, perhaps thinking that he was going to the restroom. As Winkler was leaving the tearoom, Su entered, said "Why did you hit someone? ", and pushed Winkler against the wall, holding Winkler's two hands with Su's left and then delivered two punches. He was preparing to use his knee when the screams of employees in the tearoom brought others to the scene. The head of security, Fan Da-wei, was among the first to arrive and after telling Winkler that he better provide proof if he makes accusations, promptly escorted Su from the area back to the room across from the meeting room. Winkler followed, demanding that Fan sequester and protect the witnesses. Fan did not respond to the demand, rather he proceeded to ask what one would expect "when you stomp on his brother's foot." Under oath in court Fan denied having said this, and videos taken from two angles show that Fan was in no position to have seen whether or not Winkler had had any contact with the younger Su during the earlier altercation. After three hearings before the prosecutor, an indictment and three court hearings, the Taipei District Court announced on 9 October 2008 that Su was guilty of battery.